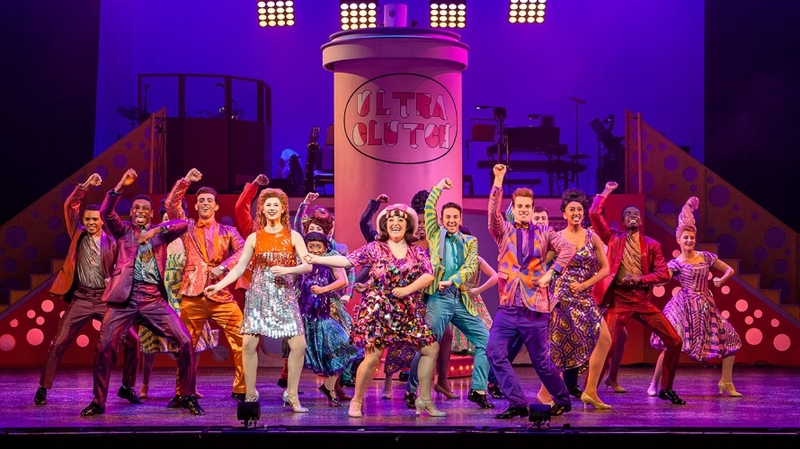 What better antidote to Blue Monday could there be than going to watch ‘Hairspray’ at the Theatre Royal? It’s the third Monday of the year and outside its raining and windy. But I defy anyone to go to this show and not find absolute joy in it and to feel the need to dance spontaneously. Set in Baltimore in 1962, ‘Hairspray’ follows the story of Tracy Turnblad. Her favourite show is the ‘The Corny Collins show’ – a dance show for teenagers which features conventionally good-looking blondes with nipped in waists and 50’s style prom dresses and dapper suits. Tracy has remarkable hair too, in fact she has huge hair, but doesn’t fit this mould at all. What’s so wonderful about Tracy, and the show, is that she doesn’t undergo a hideous transformation into something that ‘conforms’. She’s a dreamer – as evidenced by the wonderful sequence ‘I Can Hear The Bells’ when she is accidentally kissed by Link Larkin, teen heart throb – but she’s also pragmatic and compassionate. Her encouragement of her mother is incredibly sweet. Tracy doesn’t want to fit in – she wants to change the world so it fits in with her view. Don’t be deceived by the fact this is a musical: it deals with the issue of segregation between blacks and whites through the medium of the teenage dance-off and Tracy’s contention that they should all be able to dance together – black and white teenagers on the same stage. This view horrifies Velma Von Tussle, the show’s producer, and her best friend Penny’s mother Prudy. From the rats scuttling across the stage during the opening number ‘I love you Baltimore’, you know this will be a playful show. The lyrics consistently entertain and there are some gems in there. One of my favourites has to be Penny Pingleton during ‘Without Love’, a hymn to the two teenage couples Tracy and Link, Penny and Seaweed. Formerly pigtailed and knee high socked Penny sings ‘In my ivory tower/ Life was just a Hostess snack/But now I’ve tasted chocolate/And I’m never going back.’ There are plenty of double entendres but they stay the right side of cheeky, providing plenty of genuine laughs along with enjoyment of the kind of snappy, expressive choreography you would expect of a Broadway musical with all the praise this show has received. Not only are the teenagers great, and Tracy’s leading the vanguard against segregation, but the adults provide plenty of humour too. In true pantomime dame tradition, Edna is played by a male actor and Edna’s robust physicality comically dominates the short and slight Wilbur Turnblad. This fuels the comedy between them and their duet ‘You’re Timeless To Me’ was a highlight of the show. It was reminiscent of an MGM musical but again, with those funny, sharp lyrics that made the show moving without being saccharine. The failed deployment of a balloon (relating to the final musical number and a giant can of hairspray) lead to what seemed like an ad-libbed sequence between the two. The laughter and the chemistry between them was so warm and genuine and much hilarity ensued for the rest of their duet. They seemed to be having so much fun it was infectious – the audience was loving it too. Towards the end of the duet, Wilbur embracing Edna from behind led to her pronouncement ‘I can feel the bells,’ reworking Tracy’s earlier number. Sheer comic brilliance from Matt Rixon and Norman Pace (yes, of ‘Hale and Pace’ fame!) who played Edna and Wilbur respectively. Another mention must go to Brenda Edwards who played Ms Motormouth Maybelle. Her poignant performance of ‘I Know Where I’ve Been’ recalled the long fight for equality. Her voice was simply incredible and this was another example of different musical textures and styles in the show which encapsulate this as a time of change. Being produced in 2002 it could have easily become a nostalgic look back but it’s so much more than that.